We usually avoid talking about our bodies. Nevertheless, it is of great importance to ask questions and to talk about conditions that are causing pain and discomfort. For instance, the color and shape of your stool can reveal a lot about your health. Also, the color and consistency of your urine, can indicate certain disorders or deficiencies that the body might be experiencing. Therefore, the reason for writing today’s article is to show you some signs to spot in your urine, which can say a lot about your health. We will talk about substances like protein, sugar, yeast and bacteria. By looking at urine and we will also use these to detect issues like bladder infections or cancerous tumors. Before we get into it, please remember that medicine and supplements are okay, but ultimately you need to consult your doctor for further instructions about the symptoms you are experiencing. Naturally, if your pee is in a lighter color, it means that you are well-hydrated, and you urinate frequently, which is optimal. Nevertheless, there is no space for worry if the urine is a darker shade of yellow as well. This just means that you have to drink more water, however, everything is normal. A lot of factors might influence the color of the pee, like medications, chemotherapy drugs, laxatives and dyes in certain foods. Just look at the following colors and you can discover the condition of your body. If your urine is murky or cloudy, this usually indicates urinary tract infections and kidney stones. What can also influence the consistency of it is food. Other times, tiny amounts of blood can appear in a cloudy form, instead of being red. Furthermore, bladder infections like cystitis, can cause painful and frequent urination as well as murky urine. Bear in mind as well that if a cloudy pee is very common during pregnancy. Pregnant women may often experience an increase in vaginal discharge, which mixes with the urine, thus the murky look. What can cause a green or blueish urine is a genetic condition called hypercalcemia which is a rare inherited disorder that can affect babies and infants. This usually happens because of dyes and food coloring. The dyes that are used in kidney and bladder function tests can turn it blue as well. However, if this continues, go and get checked for bacteria and urinary tract infection. 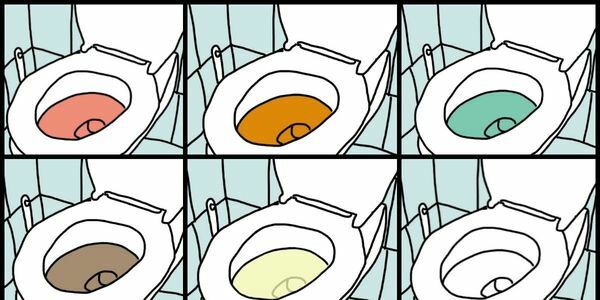 Urine that is orange in color can be caused by many different things. You could be experiencing a medical conditions connected with the liver or the bile duct. Just check to see if you have light-colored stools too, due to the fact that it might be tied to the same conditions. Also, dehydration can cause a deep orange urine color. Pink or reddish urine might mean a lot of problems. It can be also caused by something you digested, like great quantities of beets, blackberries or rhubarb. Nevertheless, you could also be dealing with serious medical conditions like kidney disease, urinary tract infections, cancerous tumors and prostate problems. Also, medications like chemotherapy drugs, laxative and antibiotics for tuberculosis might make the urine in reddish or orange color. Do not fret if there is a little foam or fizz in the urine. This might occur when you urinate faster than usual. Nevertheless, if the foam continues to occur, consult a doctor. This might indicate a high level of protein in the diet, or a serious problem with the kidneys. If your urine’s color is similar to Coca-Cola, than the body might be severely dehydrated, or it might have other serious issues. Moreover, brown urine might mean that you have consumed foods like quantities of fava beans, rhubarb, or aloe. However, if you take medications like antimalarial drugs, certain antibiotics, laxatives and muscle relaxants it might make the urine brown. Do consult a doctor it the color in the urine does not go away, because you would like to rule out conditions like urinary tract infections, liver and kidney disorders. This might seem weird to you, but you can consume too much water. You only have to drink a proper amount to stay hydrated, however, do not do it too much so that you urine becomes colorless. This will mean that you are overhydrated and this can lead to a lot of other complications. For instance, the kidneys might not work fast enough to process the urine out the body and too much water will collect in your system. Therefore, if the body retains to much water, there will be an imbalance between water and sodium in the blood. As you can see, urine and generally your body can speak tons about your health. Therefore, make sure you observe and listen, this might aid you in even saving your life. After all, the health comes first.